The Annual Biocontrol Meeting was held at the KKL Culture and Convention Center Lucerne, Switzerland on October 22th-24th 2012. The meeting is organised jointly by the International Biocontrol Manufacturers Association (ABIM/IBMA) and the Research Institute of Organic Agriculture (FiBL). ABIM provides an annual meeting place specifically adapted to the needs of the biocontrol industry. During the three days of the conference, over 540 delegates from 50 countries, representing more than 270 companies and organisations from all over the globe, exchanged experiences and obtained information on the latest biocontrol products and developments in the market. Organisers commented that the vast majority of company representatives stated that they were highly satisfied with the outcome of the conference. Certainly, this was an event with a different feel as it coincided with two major industry announcements; the Bayer acquisition of AgraQuest and the intended purchase of Becker Underwood by BASF. (As we went to press, Bayer have announced yet another acquisition in the purchase of Prophyta in Germany). In the early years of the IBMA meeting, the presence of major agrochemical companies was limited. Now these recent acquisitions have brought significant changes, with some commenting that the merger of agrochemical and biological companies brings the biocontrol industry into the mainstream and the arrival of the ‘majors’ can only help in adding weight to accelerating the industry’s development. In the scientific programme 41 presentations covered the latest updates in market development, regulatory affairs and novel products for plant protection. Over the two days of presentations, the eight plenary sessions covered topics such as regulatory harmonisation; industry and farming community experiences; biocontrol solutions for unusual crops, soil and seed applications, and as herbicides and nematicides; biocontrol solutions for diseases; biocontrol solutions for insects, scale and mites; and perspectives of biocontrol. In addition, one session provided a valuable opportunity to hear of the business experiences of four companies through the eyes of their MDs or Board Members, who included Paul Koppert (Koppert B.V.), Peter Innes (Becker Underwood Ltd), Christophe Maquin (De Sangosse S.A.S.) and Peter Lüth (PROPHYTA Biologischer Pflanzenschutz GmbH). The concluding keynote presentation on day 2 was provided by John McDougall (Phillips McDougall) but presented on their behalf by Marcus Meadows-Smith ,of the newly formed Bayer CropScience Biologics group. In the presentation entitled ‘Understanding R&D trends in agrochemical development for biocontrol companiess it was revealed that in conventional screening programmes, the number of agrochemical products that have to be processed before leading to one single successful product launch has grow from 50,000 almost 20 years ago, to 140,000 today and it takes almost 10 years between the first synthesis to the first product sale. Biological products are currently showing a 12-13 year development in comparison, but much fewer need to be screened to deliver a product which have the potential for registration. The presentation provided a summary of the expenditure and league tables of the major agrochemical companies. Other comments were provided on the rise of generics, the decline in the absolute number of actives in the market and the growth in seed biotechnology. Perhaps one of the more popular presentations was Marcus Meadows-Smith’s own contribution, in providing insights into “Experiences of a company during an acquisition by a multinational Agchem company”. One of the key differences highlighted was size of budgets , with Marcus revealing that Bayer were investing approx €2 bn over 2011–2016 to foster future growth, a level, which is unachievable for many of the smaller industry members present. The final presentation of the 3 days came from Vittorio Veronelli (CBC Europe) on the future of the biocontrol industry. The presentation concluded that despite all the progress, the Biocontrol industry still has a long way to go. In detail, he highlighted the need for a more specific regulatory framework, as today Regulation 1107 still has no provision for the specificity of Biocontrol products; an Expert group (IOBC) to support Member State evaluation of Biocontrol products; a much shorter “time to market” for products; a more direct contribution to research; and a better supporting program for tech transfer to growers. 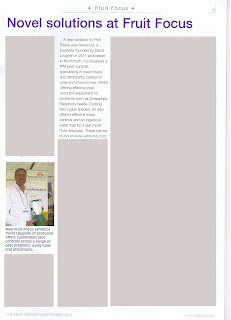 Clearly there is still much to keep industry members active for many years to come. Perhaps more significant acquisitions are to follow. There was more than one utterance of ‘buy us’ references made during the scientific presentations. Certainly there was a buzz about the conference and if there was an unwritten slogan for the event it could easily have been “it is good to be green”. Concurrent to seminars was a busy exhibition and the now established 1-to-1 networking event which provides a ‘speed dating’ opportunity for new and old attendees to establish useful contacts. Collaboration was very much in evidence throughout the event. Next year, the 8th IBMA / ABIM meeting will be held October 21st - 23th 2013 in the new location of Basel. All presentations for the 2012 event are available to view at http://www.abim.ch/abim-2012.html. 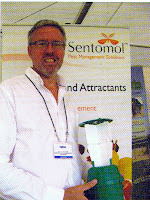 It was a rare hot July day in Kent in July 2012 when Sentomol attended the annual Fruit Focus event at the EMR grounds in Kent. This was our first major fruit show and a very successful one it was. The fine weather kept many growers away as it allowed them the opportunity to catch up on jobs in what has been a wet summer. 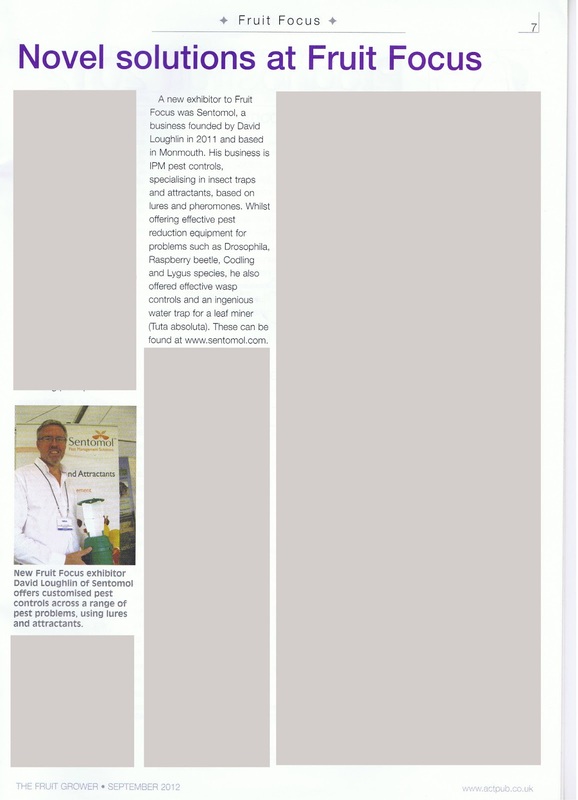 Still, we met many interesting visitors and were pleased to get a mention in the September issue of The Fruit Grower magazine. Every little helps. I am always pleased to head north to Dundee to visit the James Hutton Institute. We were invited to give a presentation at this year Fruit for the Future meeting. This free event showcases developments and trends in The James Hutton Institute’s soft fruit breeding and research programmes. It is aimed at farmers, agronomists, those in the food and drink industries, scientists and others interested in soft fruit and consists of a seminar programme followed by a tour of the breeding plots (with fruit tasting) and current field experiments. Partnering with JHI's Nick Birch we provided an overview on the semiochemical market and to focus on opportunities and development in soft fruit. The Westfalenhallen Exhibition Centre in Dortmund alternates (unofficially) with the PestEx UK show every year as the premier European pest control event. The German show tends to have more international visitors, thanks to its central location. 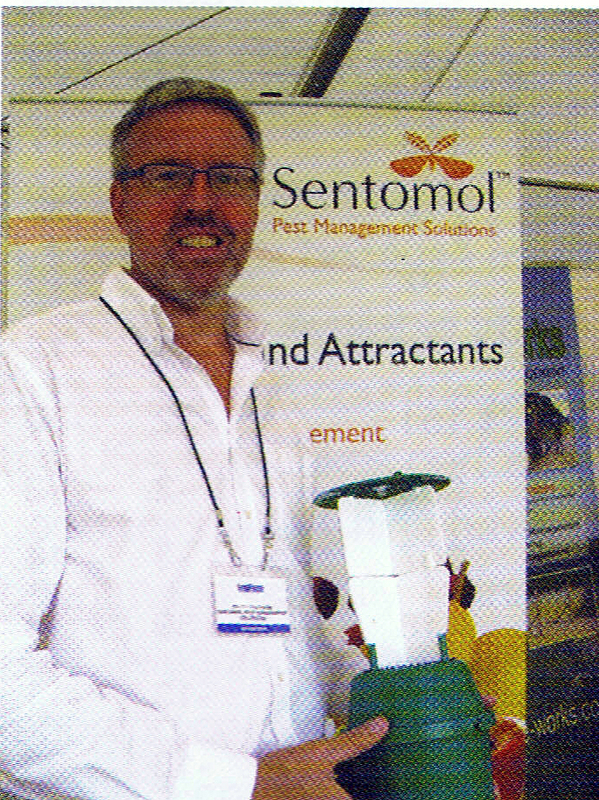 The show is organised by The DSV (German Pest Control Association), the professional association of professional pest controllers. DSV in over 300 establishments are organized to protect a lot of know-how, biological background knowledge and the latest drugs people and materials from pest infestation. This year was a well attended show with exhibitors also from outside of Europe. The website is not kept up to date between shows but the following link will take you there. http://eurocido.de/.